Should we follow the institutional money into Timber? Timberland investment has traditionally been the preserve of the private, non-industrial landowner, accounting for a staggering $150 billion globally. However over the last 20 years, institutional investors have discovered this ‘perfect’ asset and now own around $35 billion worth of timberland globally, in a combination of over 100 private pension, foundation, and endowment funds. Of that around $25 billion is invested in the United States, which represents both the world’s largest producer and user of timber. Pension funds such as Calpers, led the way in the 1980s, however it was the big university endowment funds such as Harvard and Yale that saw the true potential and invested heavily in a move to diversify their portfolios globally. Last year the Harvard Endowment Fund invested $500m in forestry and carbon credits in New Zealand. So what makes timber such a popular asset with institutions and what are the fundamentals driving this perfect asset. Timber can be classified as a specialised form of long-term bond. A forest that holds mature timber will generate cash each year through the harvest and sale of timber. These harvests can be modeled and forecasted with a reasonable degree of accuracy over many years. Since timber growth and subsequent harvests are scarcely affected by the movement of financial markets, forest investment can be structured to act and behave in many respects like a long-term bond. Most view Timberland as an investment in real estate. While traditional commercial real estate generates income from leasing, timberland derives its primary income from the sale of timber and more recently from carbon credits. However its tax that has been the major driver of forestry investment in the UK, if held for 2 or more years the Forestry land can be passed on to family members with no Inheritance tax. Timber harvest is also exempt from income tax making this especially popular as a wealth protection asset. Timber is a low risk, high return asset which has outperformed stocks, bonds and other commodities for the last 30 years. From 1973-2002, managed timber returned roughly 15% annually as an investment, while stocks returned around 11%. Timber, like most commodities, is uncorrelated to stocks and unlike all other commodities continues to grow on the stump in recessionary times. Demand & supply: global consumption of tropical hardwoods has multiplied nearly 25 times in the last 4 decades and population growth rates continue to accelerate. Around 40m acres of tropical forest are being destroyed each year and not being replaced, whilst international political pressure on forest protection increases pressure on illegal deforestation, further enhancing timber values. 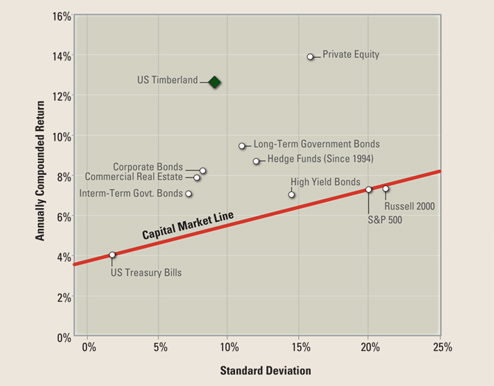 Not only does timber beat all other major asset classes, but it also does so with lower volatility. The below graphic demonstrates this. Timber has had just three “negative years” in the last 45 years whilst stocks, comparatively, have had 12 “negative years” over the same period. The last great bear market in stocks began in the late 1960s and lasted until about 1980. An investor in stocks during that period lost money due to inflation alone. Commercial timberland is affected by a different set of macroeconomic and market factors than other asset classes such as stocks, bonds, and real estate, the traditional mainstay of most investment portfolios. The addition of a low correlation timberland asset can expand the risk-to-return profile of any portfolio. Demand for timber is raising fast, especially from the emerging economies of China and India. One current forecast predicts that China’s urban population will increase from 530 million people to 875 million people by 2030. The equivalent of almost 50 cities the size of greater London will have to be constructed over the next 20 years to accommodate them, putting huge strains on global timber prices. Global consumption of tropical hardwoods has also multiplied nearly 25 times in the last 4 decades. Populations continue to swell as more people seek to consume and live the middle class ideal. Around 40m acres of tropical forest are being destroyed each year to meet the demand for hardwood product and agriculture, of which little to none is being replaced. International political pressure on forest protection is increasing, the invention of the Carbon Credit has created a value for living trees. This has a very positive effect on global climate change, however it will only seek to further enhance timber values through supply shortages, good news for forestry investors. Aside from its carbon capturing properties, forestry is an incredibly green construction material. The table below demonstrates the amount of energy needed to create each respected construction material. Also by using sustainable timber the carbon within is locked up for the life of the project. Aside from offering risk adjusted returns and portfolio diversification, timberland continues to add value due to the biological growth of trees at no extra cost unlike other real-estate assets, all the while sequesting carbon from the atmosphere. Trees grow in volume, size, and ultimately into increasingly higher-valued products. For example, trees begin as lower-value pulpwood, then grow into low value saw timber trees (9 to 12 inches in trunk diameter) before maturing into high value saw timber (greater than 12 inches in trunk diameter). As a tree grows into a larger and higher value product classes, the monetary value of the tree increases along with its carbon credit value. The effect of inflation and possible downward movement in timber prices is mitigated by volume growth; however what makes timber such an attractive investment is the effect of upward price movement is compounded by volume growth. Timber continues to grow although at a slower rate as trees mature. This allows the investor to “warehouse” the timber “on the stump,” until such time as market conditions are optimal. Timberland is an incredibly diverse asset and can be structured to meet different investment objectives. For example, higher cash flows can be achieved by including a higher proportion of more mature timber holdings such as teak. If long-term gains are more important than regular cash flow, this goal can be achieved by acquiring young plantations and investing at the seedling stage for maximum long term uplift combined with high growth rates and intensive management techniques. If the investors’ objective is a balance of cash flows with an emphasis on long-term appreciation, various timber age classes can be included in the portfolio to achieve this goal. In addition, investment returns can be improved with a variety of additional structuring and management options such as carbon credits, the use of leverage, selling selected properties that have real estate development potential or recreational use value such as shooting right. In short, timberland investments have the versatility to be shaped through financial engineering to meet a variety of goals for both the institution and the sophisticated private investor. Its amazing how few investors have exposure to forestry in light of the above, a fact which won’t stay this way for long, double digit returns and tax benefits will attract a vast number of investors especially as the green revolution takes hold. Tree growth averages about 8 per cent a year. “If the market goes up that is an added bonus [to the tree growth]. This is what makes timberland a safe investment,” says Liane Luke, head of timber investment at Four Winds, which manages specialist fund Phaunos Timber. Another attraction of forestry investing is that when timber prices fall, there is still a “steady offset of the physical growth of the tree”, says Eva Greger, who runs GMO Renewable Resources, the large Boston-based fund manager that has been putting money into forestry since the 1990s. Posted on January 5, 2010 Author B JefferisCategories Forestry, Green BasicsLeave a comment on Should we follow the institutional money into Timber? 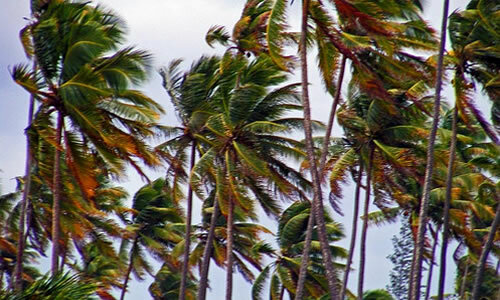 REDD forest schemes to offer protection? As momentum builds in the weeks before December’s climate negotiations in Copenhagen, our planets rainforests are firmly in the spotlight with UN backed REDD forestry schemes the driving force behind rainforest conservation. 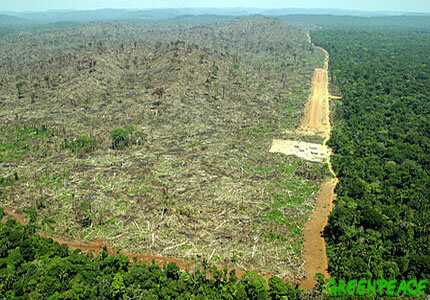 Continue reading REDD forest schemes to offer protection? 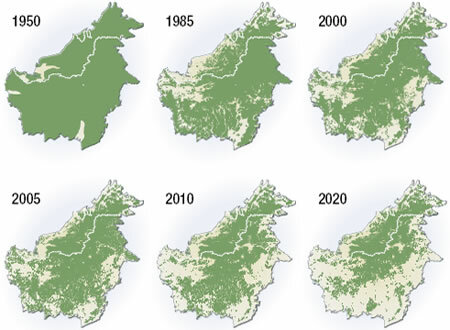 Posted on November 30, 2009 December 13, 2009 Author B JefferisCategories ForestryLeave a comment on REDD forest schemes to offer protection?